You may have forgotten the birthday of someone special but great belated birthday wishes, like the amazing belated birthday messages here, can make up for it...big time. If you want more tips on picking the best belated birthday wishes, take a look at the helpful hints right here. A belated "happy birthday" from your BFF. Sure, I completely forgot your birthday but I promise you that this won't happen again this year. Violets are blue. Roses are red. I'm too late for this year's party, so think of this "happy birthday" as a year ahead. Hope your birthday was fantastic! I’m truly sorry for forgetting it. I messed up and I would like to make it right. What do you need me to do for you? Nothing gross, though! A belated "happy birthday" to you, my best, best, best friend. 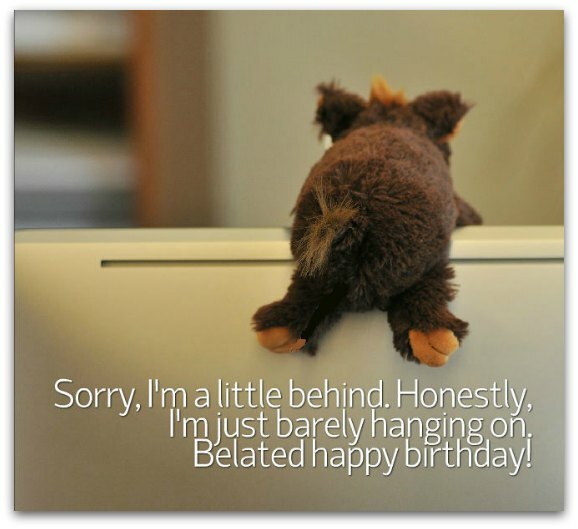 Sorry for the late birthday wishes but you know me: I live in the slow lane — so slow that I'm always behind you and everybody else. That's why I'm way behind you when it comes to celebrating your birthday. I'm so sorry for missing your birthday but look at it this way: your birthday celebration is so much longer this year because of me. Belated birthday wishes are like the Tooth Fairy, Santa Claus and Easter Bunny. All come bearing gifts...just not on your birthday. Happy birthday, anyway. Grammarians (grammar experts) believe that "happy belated birthday" is grammatically incorrect and "belated happy birthday" is correct. Learn why on public.wsu.edu. 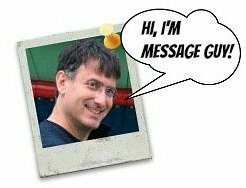 For other helpful hints, check out Message Guy's tips on choosing the right belated birthday messages right now. I have good news and bad news for you. First, the bad news: I forgot your birthday. Now, the good news: I also forgot how old you are. Hope your "whatever" birthday was great. Your birthday is undeniably a special occasion worth celebrating more than once a year! Happy birthday...again. On your birthday, it's a time for your good friends to celebrate you. After your birthday, it’s a time for your not-so-organized, slightly forgetful, yet well-intentioned, good friends to celebrate you! Sooooo, happy birthday. I assumed that, at your age, you would forget that I forgot your birthday. But I was incorrect — I forgot that you forget nothing except my birthday. I hope you had a positively wonderful birthday. Anyway, enough about you. Let's talk about me. Sorry, I missed your birthday. This is what happens when you don't remind me about it. Try a little harder next year. Anyway, happy birthday!. Happy birthday (a little late). Sorry, your birthday just slipped my mind. I hope you still consider me your friend. 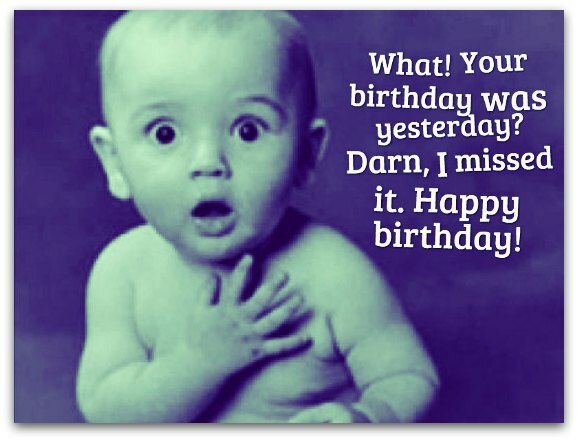 Sure, I missed your birthday, but I would never miss the chance to wish "happy birthday" to you! Hope yours was a truly happy one! Belated "happy birthday" to a friend who has earned the right to forget my birthday at least once in our lifetime (no expiration). Happy birthday (only a day late)! You can't really blame me — you're so important to me that I thought I would just extend your birthday by another 24 hours. More than anyone I know, you deserve to have your birthday celebrated at least twice a year. Happy birthday! Wishing you a late, yet incredibly warm "happy birthday" that you can carry in your heart! Hope you had an amazingly special day. 1, 3, 5, 7, 9, I apologize that this birthday wish is not on time! 5, 4, 3, 2, 1, I hope that your birthday was fun.